June 17 , by Mardi Robyn. 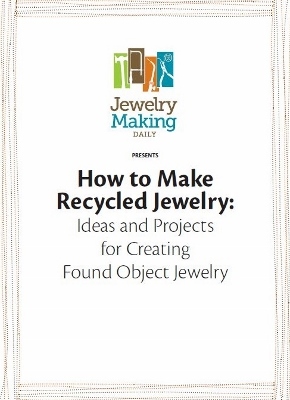 I am happy to share this eBook with you “How to Make Recycled Jewelry” by Jewelry Making Daily. The eBook features three jewelry making projects you can make that features objects you can find around your house. Included in the eBook is helpful tips and tricks you can use in your jewelry making projects. These tutorials inspire you to think outside of the box and create something unusual that catches the eye and is sure to make a statement of your own unique style. Each of the three tutorials include colorful photographs, and step-by-step instructions to smoothly guide you as you create your next jewelry piece. I downloaded the eBook and was inspired. I learned a few new tricks that I did not know. Did you know you can use a hole punch on aluminum cans? How cool is that! My favorite tutorial of the three is the Vintage Illustration Pendant by designer Eleanore Macnish. I want to try making one for myself. Are you curious to see what exciting projects are in this Free eBook? Download it today by clicking here. The link will take you directly to the page for the download on the Jewelry Making Daily website. On this page you will find more information about the free eBook and you will be asked to enter your email address and the free eBook will be sent to your inbox. What are you waiting for! Take a look and be inspired to create your own jewelry using objects around your home.